The stock Mitsubishi TD04L-9B 6 cm^2 turbochargers allow for very quick spool up time and top-end power adequate for a production vehicle. They are designed for optimal flow of 265 CFM @ 15 PSI. Maximum boost from the rather small 9Bs is around 19 PSI. This pressure can typically not be held to redline, dropping off to 10-12 psi in most if not all applications. Stock boost pressure for the 1991 through 1993 VR4/TT is roughy 9.5 PSI and 12.5 PSI for 1994 and newer models. High boost pressures are only one part of the power equation. Volume of air flowing through the engine is actually more important. Larger turbochargers allow for substantially more airflow which gives it the capability to retain higher boost throughout the RPM range. Porting can also enhance the performance of a turbocharger beyond designed behavior. Bigger turbos truly make use of reduced restrictions in the intake and exhaust systems. Clipping is also often used on the turbine. Clipping will typically increase turbo spool-up time (lag) but also can allow the turbine to spin longer in its optimal range, reducing overboost and between shift spool-down. Basically the same turbocharger as the 9B but with two important changes. First off, the turbine housing has a slightly higher a/r ratio meaning that it can make more effective use of the exhaust gases. The housing is also slightly larger in volume despite the fact that is has the same turbine housing designation (6 cm^2). The biggest and most obvious difference is in the design or "trim" of the compressor wheel. The 13G compressor wheel uses a more aggressive trim which sacrifices a small amount of spool up time which introduces a small amount of lag compared to a stock turbo. Noone really complains about this fact so that is an indication of just how minimal it is. The pay-off is more flow, higher boost pressures, the ability to maintain achieved boost further into the RPM range and therefore a lot more power. 13Gs can be used successfully with stock injectors but may introduce additional fuel requirements. Flow is rated as 360 CFM @ 15 PSI. 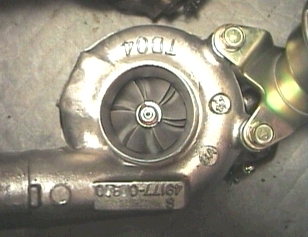 The 15G is not a factory produced Mitsubishi turbocharger model. A true 15G starts life as a 13G. The center of the compressor housing is bored to fit the very aggressively trimmed and larger 15G compressor wheel. The 15G can flow alot more than a stock turbocharger. A non-ported 15G reportedly flows 404 CFM @ 15 PSI. The 15G is considered a serious modification to the VR4 engine. Attention to the fuel delivery system is a necessity. Allied Signal produces the Garret turbochargers. Their well respected designs are used in many applications from consumer applications to heavy industrial and marine engines. Adapting a Garret turbocharging requires manufacture or purchase (if available) of new exhaust manifolds since the mounting is quite different than the TD04L. It may be possible to fabricate or purchase adapter plates. 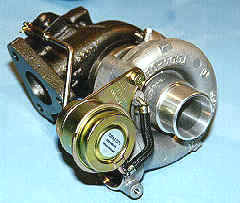 Hybrid turbochargers typically use Garret compressor housings grafted to a Mitsubishi TD04L turbine (hot) side. Use of the TD04L housing allows bolting these hybrids up to the stock exhaust manifold. The TD05 series of turbochargers offer higher flow and come in a wider range of compressor and turbine options. The exhaust flange on the turbine however uses four bolts and does not mate with the stock 6G72 exhaust manifold.